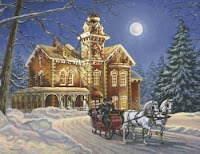 “Hi Max, just wanted to let you know we received the 2 puzzles you were so nice to send to Sunrise in Cohasset. Thank you so much!! Your choice was perfect, was so fun to try them out with the residents yesterday, and what a success. Watching them respond to getting a piece in was wonderful, the large sized pieces are so much easier. They marveled at the large beautiful finished puzzles, and even liked just running their hands over them. Looking forward to working the puzzles with more residents today, you truly are making a difference in people’s lives. Thanks, Springbok, for making my dream become a reality!